One of the great things about travel is taking advantage of the high vantage points that hotel windows provide. Usually I'm enamored with shooting at twilight, capturing the last light in an inky blue sky while building lights begin to illuminate the foreground. But one morning, I left the curtains open and was reminded that dawn light adds new dimensions to cityscapes. 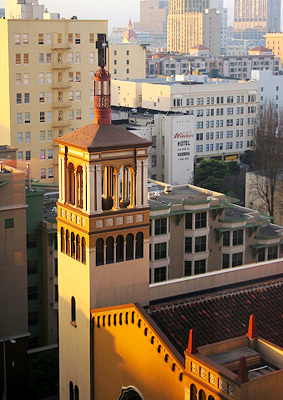 This shot of Glide Memorial Church was recorded at 7:45 am from the 12th floor of the Hilton across the street. A few hours later, everything had flattened out and there wasn't a good shot in sight. Captured with a Canon Digital Rebel XT through the hotel window, 1/30 @ f-4.5, ISO 100.